It rained. 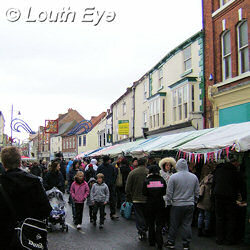 However the crowds were out in force for the annual Christmas Craft Market organised by Louth Lions. 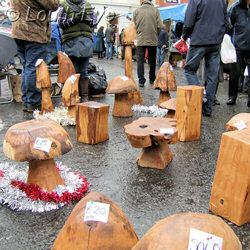 Stalls extended around Mercer Row, down Eastgate, and into the car park behind Meridian House. The market consisted of a good mix of different crafts: lots of wood turners, handmade soap sellers, jewellery makers, crafters, potters, scarves and hats, and so on. There was one stall with wicker baskets in all shapes and sizes, and another with some really attractive glasswork, including some shiny coasters I had my eye on. 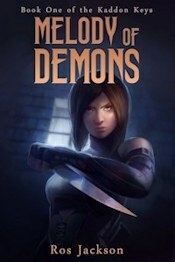 As well as crafts, there was literary representation in the form of local author Susan Dodd, who writes books for 7-11 year olds based on the cat Benson, and in the form of "cyber poet" Jane Air. Theatre was in evidence too: the Playgoers will be putting on Babes in the Wood from 13th to 21st January, and Katherine Pennel and Jennifer Barrett were amongst the costumed actors handing out leaflets to promote this local production. As usual there was music and entertainment on offer. 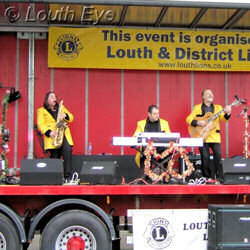 The market opened with rock 'n' roll from a band on the main stage. Later on there were carols as well. 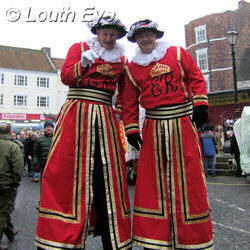 Of course, no Louth Christmas market would be complete without that guy who walks round on stilts, cracking jokes. 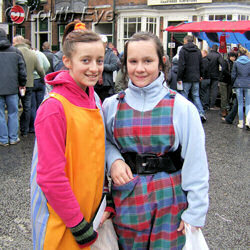 This year there were two of them, dressed as beefeaters, adding even more colour to the event. 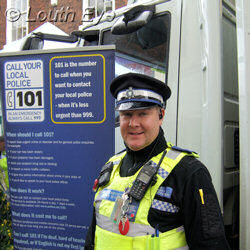 Lincs police had a good presence, as they always do at events like this. They also had a van and a stall, where they were publicising their 101 non-emergency number, which has been rolled out nationally. They were giving out leaflets on crime prevention, and invisible markers for postcoding your valuables. The Lincs Road Safety Partnership was also giving out advice as part of its campaign against drink driving, including a recipe sheet for some tasty non-alcoholic drinks. 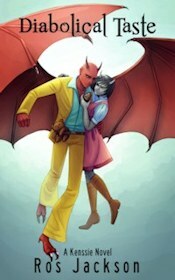 Unfortunately the rain was relentless, and it put quite a dampener on things. By mid-afternoon the crowds had thinned out considerably, although that did mean it was easier to get in and actually see what was on the stalls. Check out the markets page for details of forthcoming Christmas market dates, and the events page for other happenings in the near future.